Project Rising Beetle | Celebrating 15 years of Medabots! 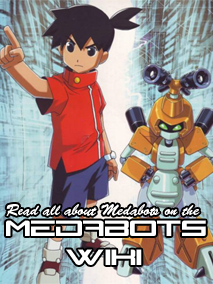 Celebrating 15 years of Medabots! The official Medarot franchise web portal, Medarotsha.jp, has updated with a countdown clock ticking to November 28th, 2018. November 28th marks the 21st anniversary of the original Medarot game’s debut on the Gameboy. Imagineer has a variety of festivities planned, from the start of the Medarot Club Room 2018 @ Kichijōji event and the debut of a new line of merchandise from GraffArt. The company has also teased a Medarot announcement. Japanese merchandise company A3 has announced a new Medarot product line to be produced under their GraffArt brand. Little was shared about the kind of items that’ll be made, though the company has previously manufactured badges, phone cases, power banks, key chains, clear files, etc. The company published a key visual (left) to promote the announcement. The Medarot merchandise will go on sale starting November 28th at the GraffArt Shop and A3 Market. The line will be unveiled in the near future. “Like” Project Rising Beetle on Facebook!